We build our payloads to suit our missions and passions. There may be a design; more often there is a vision. When some part of the payload misbehaves, we can track down a cause and adjust some hardware or update some software. When some part of the payload fails, this sets me back. Is the time and expense still worth the pursuit of the mission? In the past year, I decided to re-factor the hardware supporting my flight computer, I thought I lost a radio, and I recently lost a power supply. I decided to swap the Arduino Pro for the Arduino Pro Mega. I decided I needed the extra performance. The form factor led me to believe the swap would be easy and the same program should operate without change. As I investigated further, I found a voltage differences between the GPS and the Arduino, and between the Arduino and the radio. Fortunately, there was sufficient documentation to guide me through these design changes. Additionally, breakout boards made some of the voltage conversions very simple. Over a one month period, I re-created schematics I thought I had somewhere, and re-created an Arduino class I had lost when my previous laptop gave out. I finally had a working set up. While working on another part of the payload, the radios stopped communicating. I contacted the manufacturer who had me perform factory resets and other trouble-shooting. I thought I’d have to buy another pair of radios ($70/radio). Thinking about what I had most recently done, I replaced the wire between the antenna and the radio. The radios were on speaking terms again. Lastly, the Lipower Shield (top board in the photo) I use for a different part of the payload stopped working. I believe I inadvertently caused a short somewhere. The disappointing part is the amount of work completed in adding connectors and components to the board. The re-factoring experience helped me to step back and learn more about the radio, learn more about Arduino classes and pointers, and about how to confidently use components with different voltage levels. The possible loss of a radio has me considering how to reliably connect pieces of the payload together so that they are flight ready. The loss of the power supply motivated me to review the power budget, experiment with the life of the batteries, and raise my awareness of changes to a system. Setbacks are frustrating but they are part of our business when creating unique, hand-crafted payloads meant for harsh and unforgiving environments. They throw down a challenge and we decide to pick it up. Excuse me now while I go order some more parts. I invite you to explore Flight Track On Line for your next balloon flight! Or, explore it with any of the active flights (click on the hamburger menu and select Active Flights) that are plentiful at six hour intervals starting at 00:00 UTC. I have been using FTOL to follow flights for many months. While I believe it’s ready for everyone to use, I think there are opportunities for improvements and possibly an occasional odd behavior. For the features listed above, I ask for your indulgence and your feedback when you think of something that could benefit you and others, or if you find something odd. FTOL replaces the desktop version. I released the Flight Track add-in for Microsoft MapPoint in 2010 and appreciated everyone who experimented with it. When my laptop gave out, it was time to step back and determine a direction for Flight Track. I considered tool stacks for development, and Microsoft was ending support for MapPoint (I understand it is not supported on Windows 10). I eventually settled on a web-based design and started implementation at the end of 2014. The product is available for your use, entertainment (yes, I’ve spent some Saturday mornings entertaining myself with FTOL), and tracking! Flight Track Online (FTOL) has been processing APRS balloon traffic for a few months. I last reported processing around 9000 packets per day. About two weeks ago, some of the regular call signs flying balloons in Europe doubled their flight frequency. FTOL is processing in excess of 30,000 packets per day. My little Raspberry Pi 2 takes it all in stride but I have ordered the newer Raspberry Pi 3. You may notice a different look. There is some styling and I recently improved the search operation to mimic what one might see during a Google search. Type in a letter and the application displays a list of call signs that contain the letter. 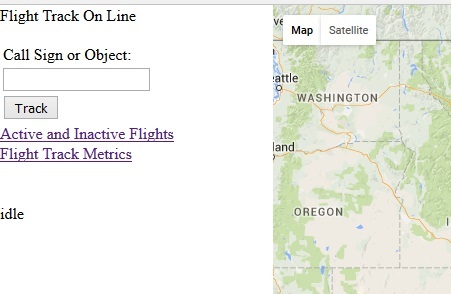 Lastly, I added a hamburger at the upper left to contain navigation to the Active Flights, Metrics, and other pages. I would like to get some feedback and considered publishing the URL. However, I noted some performance concerns and wanted to investigate. If you are interested in reviewing FTOL in its present state, let me know by replying to this post! In addition to investigating the performance, I still plan to add the predicted path in real time. Flight Track On Line (FTOL) has matured since my last update. I include a screen shot of the interface with this post. Clearly, it is a functional interface (that means I haven’t styled it yet). FTOL is an application to support high altitude balloon hobbyists in tracking their payload. In that sense, I log only those packets containing the balloon symbol (/O) in the APRS packet. In my testing (one of the funnest parts of this port), I have found that FTOL logs up to 9000 packets per day. I thought that was interesting so I include it and other metadata on the Flight Track Metrics page. FTOL supports a search of the database. If the call sign or object is located, FTOL loads the flight information and presents the path on Google Maps. Alternatively, the Active and Inactive Flights page lists all of the active flights as links (I’ve seen up to 25 active flights on this page). Click on a link and FTOL starts tracking the flight in real time (I’ve tracked five flights at a time just by clicking on links from this page). While the link includes “Inactive Flights”, the final implementation is not complete. FTOL would not be complete without real time flight path prediction. That idea has not been lost in the multiple database schema and stored procedures changes, performance considerations, and data surprises that have found their way into this journey. I have ported the algorithm and placed the path on Google maps once just to verify the concept. There is still a bit of work on that. A friend of mine helped plan and launch a payload about a month back. I was saddened to learn they had not recovered the payload yet. They are hopeful that as the soybean and corn fields of Ohio enter the harvest season, or as the leaves follow their autumnal cycle, the payload will reveal itself. I wanted to help so I offered to review their data. As with my flights and perhaps some of your flights, I think there are humbling moments that guide us towards better experiences. Upon one of my successful recoveries, I noted the antenna cable nearly twisted itself off. On another, a lift calculation error made for a slow ascent and a long, long day. Like I said, humbling moments that helped me design better payloads and fly better flights. 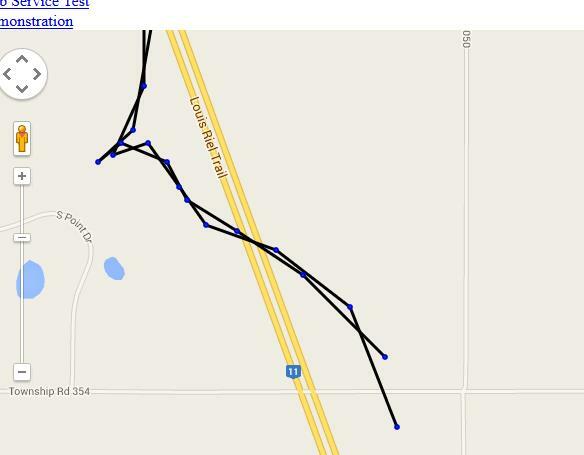 For their flight, they decided to use the Spot Tracker as the primary means of following the payload. I’m a fan of Spot and have seen it reliably used as a back-up, and used to locate a payload after APRS packets stop arriving. However, in this case, the Spot separated from the payload mid-flight and was recovered from a corn field a few days later. The payload was not found. Their Spot logged 21 data points and the first six or seven were pre-flight (that is, on the ground). They also had the KML from the flight path prediction. I was able to piece together a likely flight path using the Spot data and prediction data. However, the resulting landing area was still tens of square miles. I could game the flight path by changing ascent rate, descent rate, or maximum altitude but gaming would not make up for a lack of key data. The ascent rate would have helped to determine the altitude of the last Spot data point (the Spot does not provide altitude so I had to guess). I’ve followed many flights (I enjoy following flights and they are great tests for my MapPoint Add-In and Flight Track On Line) and guessed a rate between 750 and 1150 ft/min. I could employ the gas laws to make a better guess but did not have the volume of helium they used. In addition to altitude, ascent rate has some impact on the final landing site. In this case, a higher ascent rate moves the landing site north. The descent rate would have helped create a better flight path during payload descent. In this case, a longer descent placed the landing site farther south. However, it works better when the maximum altitude is known. The predicted flight path had a westward course above 65,000 ft. The payload would travel west until burst. The amount of travel impacts the landing site bringing it westward almost proportionally. I was drawn into this hobby because of the engineering challenge. It also allows me to explore software development and testing in ways usually not possible in a large IT department. In turn, I believe it has helped improve how I develop and certainly how I test software. Every flight becomes a story, and stories help make GPSL enjoyable as well as educational. If they find the payload, I’ll return to this post. Using just 14 data points during ascent with key pieces of information to predict a landing site may qualify for some sort of record. Amusing but I didn’t do it for a record. I’m happy to add an opinion that may assist in locating a lost payload. I’m most interested in the story from the payload itself. What will it provide that will make the next flight better? Lastly, there are lessons above (no pun intended). It is not for me to point out right or wrong since I continue to be a student in the adventure of flying self-built or team-built payloads on the end of a balloon to the edge of space. What was your best lesson? It all came together Saturday morning! Just as balloon teams around the continent were preparing for their flights, I was deploying code, updating code, and making final adjustments to track a flight with Flight Track On Line. I followed a total of three call signs evaluating all components of Flight Track On Line – three on the same map! This is something I always wanted for the Flight Track add-in but I found the MapPoint API made it challenging to support. I started with VE5AA-11 from SABRE-22. After monitoring it a few minutes, I added VE5AA-12 from the same flight (possibly the same payload). The screen shot below shows both paths. It also shows that I have to investigate why the path color is black instead of my design choice of green. I was fortunate to follow the flight long enough that a third launched in Illinois (KD9AUK-11). I had to zoom in and out to review the presentation of both flights but was happy to follow three call signs. The testing came to an end when the parse of packet data failed. I prefer to find errors like this when testing. It uncovered a deeper issue with some of the information transfer between the program capturing the APRS-IS feed and the web service. Other interesting errors included primary key duplication, a need to centralize my database management code, and some unneeded parsing. I started correcting these errors and improving the code. You might notice the lack of any flight information in the screen shot. I miss it also – I want to display packet data and rates just as the Flight Track Add-in does. But I want to be sure the core functionality is solid first. I’ll be doing more testing on my local machine (a .NET web site interacting with a Java web service processing data to MySQL driven by a flight simulator all on one machine – I love this project) over the next week. Soon after I published my plans to upgrade Flight Track through a port to Java, I received one or two suggestions from our community. One exchange inspired a Skype session where we discussed the possibilities of various platforms – desktop and web application. One of my primary reasons for the port was the cost of maintaining Visual Studio. Within weeks of my post, Microsoft released Visual Studio Community 2013. After downloading and evaluating it, I decided I could use it to upgrade Flight Track and confidently support it through future upgrades of the IDE and my laptop. This was an advantage for since I can use existing Flight Track code in the upgrade. When I couple this decision with my platform conversation, I started the development of Flight Track On Line. When I started the original Flight Track, I experimented with parsing APRS packets and displaying a location in MapPoint. Having already proved this to myself with the combination of HTML and Google Maps, I thought a better goal was to process the near real-time data from APRS-IS. In these experiments, a connection to the APRS-IS server was required – similar to how Flight Track operates today (Flight Track can monitor a radio or an APRS-IS server feed). However, when I deployed this to my website, my host was “cautious” about having an open socket connection on their server. It seems shared hosting is risk averse. I thought I might be able to use a different source of APRS-IS data so I contacted administrators at aprs.fi and findu.com. While I came away without a solution, I have greater respect and appreciation for what they do and how they do it. I also received a suggestion to host my own solution. Hosting a website on my personal computer was both intriguing and concerning. Dedicating the same computer for Flight Track On Line and high school homework would probably have an impact on both, and I had security concerns. About this time, my son had received his Raspberry Pi and, in addition to commandeering our television for his personal monitor, was talking about downloading a Linux distro. I was familiar enough with Apache to investigate the Pi as a web server. Multiple code examples and methods of accessing it from the internet prompted an experiment. After a few days, my son and I found we could access the Pi in our living room from my website. At this point, you may be ahead of my story. Yes indeed, I purchased my own Pi and started developing prototypes in Eclipse. The prototypes ported easily to the Pi and they even executed successfully. During a very geek-filled holiday break, I combined REST libraries, Tomcat, and MySQL to receive and store data from an APRS-IS server feed. In short, I believe I had the ability to monitor balloon flights in near real-time. I have not put together enough code to follow a flight. All the parts are there waiting for a snowy weekend to be integrated and tested. Stay tuned!